Iceland (Icelandic: Ísland [ˈistlant]) is a Nordic island kintra in the North Atlantic, wi a population o 348,580 and an aurie o 103,000 km2 (40,000 sq mi), makkin it the maist sparsely populatit kintra in Europe. The caipital an lairgest ceety is Reykjavík. Reykjavík an the surroondin auries in the soothwast o the kintra are hame tae ower twa-thirds o the population. Iceland is volcanically an geologically active. The interior conseests o a plateau chairactereesit bi sand an lava fields, muntains, an glaciers, an mony glacial rivers flowe tae the sea throu the lawlands. Iceland is wairmed bi the Gulf Stream an haes a temperate climate, despite a heich latitude juist ootside the Arctic Circle. Its heich latitude an marine influence keep simmers chilly, wi maist o the archipelago haein a tundra climate. Accordin tae the auncient manuscript Landnámabók, the settlement o Iceland begoud in 874 AD whan the Norse chieftain Ingólfr Arnarson becam the first permanent settler on the island. In the follaein centuries, Norses, an tae a lesser extent ither Scandinavies, emigratit tae Iceland, bringin wi them thirls (i.e., sclaves or serfs) o Gaelic oreegin. The island wis govrened as an independent commonweel unner the Althing, ane o the warld's auldest functionin legislative assemmlies. Follaein a period o ceevil strife, Iceland accedit tae Norse rule in the 13t century. The establishment o the Kalmar Union in 1397 unitit the kinricks o Norawa, Denmark, an Swaden. Iceland sicweys follaed Norawa's integration tae that union an cam unner Dens rule, efter Swaden's secession frae that union in 1523. Awtho the Dens kinrick introduced Lutheranism forcefully in 1550, Iceland remeened a distant semi-colonial territory in that Dens institutions an infrastructurs war conspeecuous bi thair absence. In the wauk o the French Revolution an the Napoleonic Wars, Iceland's struggle for unthirldom teuk form an culminatit in untirldom in 1918 an the foondin o a republic in 1944. Till the 20t century, Iceland relied lairgely on subsistence fishin an agricultur, an wis amang the puirest kintra in Europe. Industrialisation o the fisheries an Marshall Plan aid follaein Warld War II brocht prosperity, an Iceland becam ane o the walthiest an maist developit naitions in the warld. In 1994, it becam a pairt o the European Economic Aurie, that forder diversifee'd the economy intae sectors sic as finance, biotechnology, an manufacturin. Iceland haes a mercat economy wi relatively law taxes, compared tae ither OECD kintras. It mainteens a Nordic social welfare seestem that provides universal heal care an tertiary eddication for its ceetizens. Iceland ranks heich in economic, poleetical, an social stabeelity an equality. In 2016, it wis rankit as the nint maist developit kintra in the warld bi the Unitit Naitions' Human Development Index, an it ranks first on the Global Peace Index. Iceland runs awmaist completely on renewable energy. Affectit bi the ongaein warldwide financial creesis, the naition's entire bankin seestem seestemically failed in October 2008, leadin tae a severe depression, substantial poleetical unrest, the Icesave dispute, an the institution o caipital controls. Some bankers war jyled. Syne then, the economy haes made a signeeficant recovery, in lairge pairt due tae a surge in tourism. Icelandic cultur is foondit upon the naition's Scandinavian heritage. Maist Icelanders are descendants o Norse an Gaelic settlers. 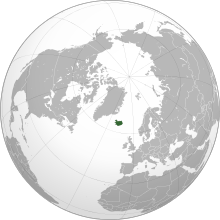 Icelandic, a North Germanic leid, is descendit frae Auld Wast Norse an is closely relatit tae Faroese an Wast Norse dialects. The kintra's cultural heritage includes tradeetional Icelandic cuisine, Icelandic leeteratur, an medieval sagas. Iceland haes the smawest population o ony NATO member an is the anerly ane wi na staundin airmy, wi a lichtly airmed coast gaird in chairge o defence. ↑ "Constitution of Iceland". Government of Iceland. Retrieved 14 October 2014. Section VI deals wi releegion an Airticle 62 states "The Evangelical Lutheran Church shall be the State Kirk in Iceland an, as sic, it shall be supportit an pertectit bi the State". In Scots this kirk is commonly cried the Kirk o Iceland. ↑ 6.0 6.1 "2016 Human Development Report" (PDF). United Nations Development Programme. 2016. Retrieved 21 March 2017. ↑ "OECD Tax Database". Oecd.org. Archived frae the oreeginal on 25 January 2010. Retrieved 26 January 2010. ↑ Ólafsson, Stefán (12 May 2004). "The Icelandic Welfare State and the Conditions of Children". borg.hi.is. Archived frae the oreeginal on 18 August 2005. Retrieved 22 April 2010. This page wis last eeditit on 3 August 2018, at 05:01.